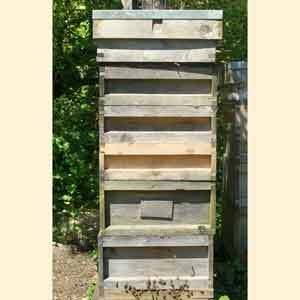 © How much space does a honey bee colony need and how many brood boxes and supers are needed for a National bee hive? To give the short answer - a minimum of 1 Standard Deep and 4 Standard Shallow boxes* or the equivalent** will be needed for a colony population at its peak***.although we recommend using 2 Standard Deep boxes and 3 Standard Shallow. This is obviously a general, simplified answer but it is a good guide to help planning. The real answer will naturally vary according to the time of year, weather, location and habitat to name just some of the many variables. The natural genetic diversity of honey bees means that it will also vary from one colony to another. Too little space means overcrowding and with nowhere to expand the colony will possibly prepare to swarm. Too much space impedes the colony's ability to heat and ventilate to control the temperature and atmosphere of the hive. Maintaining the amount of hive space at an optimum is one of the main reasons for inspecting a bee hive. Anticipating the needs of the colony is the essence of beekeeping. Normally for a nucleus colony starting in early summer, 1 Standard Deep box is enough space for the brood and bees that it will produce in its first year. The colony might fill the box by the end of summer but normally it will be unable to fill a second before winter. At the end of the season it is better that a colony is left temporarily overcrowded instead of having empty space left above them over winter. In any case, the swarming season is over, the population of the colony will decrease slightly before winter and the colony will occupy less space clustered tightly together as temperatures drop. When should extra boxes be added to a bee hive? During the active season when colonies are expanding, normally from March to July. Additional boxes should be provided if bees are seen occupying all but 3 frames of their box (or the top box if more than one box is being used). Although bees will prefer to store honey above their brood nest they also prefer to build their honeycomb downwards which can create a dilemma. The bees might ignore the box entirely or even start destroying the wax foundation. They will not move into the space provided at all if low temperatures or bad weather forces the bees to cluster or if there is no nectar flow. Bees are always reluctant to move through queen excluders so it is better to manage colonies without them unless necessary. When a second box is added for brood early in the year it can be placed under the first box as a nadir (the opposite of a super). The technique of nadiring can also be used as a swarm prevention throughout the swarming season. The nadir provides empty space for clustering foraging bees when they are not foraging which would otherwise cause congestion that can initiate swarming. * WBC bee hives have narrower boxes containing one less frame than the National bee hive so a minimum of 1 Standard Deep and 5 Standard Shallow boxes or the equivalent. ** The variety of National bee hive boxes allows different combinations of depths and widths to be used. The use of 2 Standard Deep boxes for the brood (Double Brood System) with additional Shallow Boxes is recommended but this is a matter of personal choice, there is not a right or wrong way. *** This space is needed for the brood and adult bees regardless of any honey stores. The maximum space needed for brood is naturally variable but it is finite, a product of the number of days that a cell is occupied (21 days from egg to emergence of adult) and the maximum number of eggs produced by a queen each day (this will naturally vary from queen to queen but will be between 1500 - 2000). This means a maximum of 42000 (21x2000) cells will be needed for brood. The brood would not occupy more than 1 Standard Deep and 1 Standard Shallow. The other 3 Standard Shallow boxes provide space for the adult bees and for the storage of about 50kg, 120lb of honey which would be an above average year.